Started in the UK in 2013, The Happy Startup School was borne out of a small digital agency run by two old school friends from London. They were disillusioned with the world of startups and business they were in – a world where chasing investment and a fast exit was more important than any happiness or impact. They believed there must be a better way. Fast forward 3 years and they've moved on from agency life as this humble idea has now grown into a growing, global community of 100,00+ purpose-driven entrepreneurs and changemakers that believe there's more to life, and business, than making money. They've built their reputation on putting on transformational events and online programs that inspire, empower and connect likeminded people that want to leave a positive dent in the world. Now with the support of our team at Minga we're bringing their approach to Israel. Carlos and Laurence wanted to say a few words in the run up to our first event. Hope to see you at one of our events soon. Join us for our first event in Tel Aviv on Wednesday August 3rd at 7pm where we'll be joined virtually by Carlos and Laurence from their UK base. Plus you'll get to connect and share ideas with likeminded people. Connect with more than 350 budding entrepreneurs, founders and changemakers and share ideas on how to explore the relationship between happiness and entrepreneurship with likeminded people. 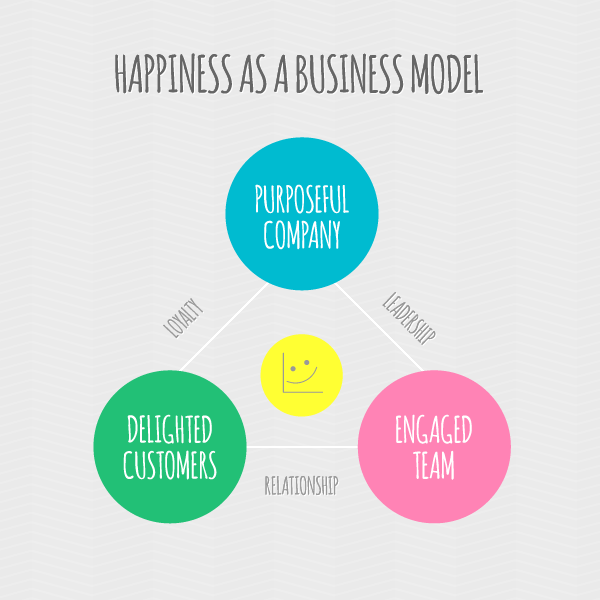 A bit of background to the happy startup approach and business model canvas. One of the highlight talks from The Happy Startup Summercamp. Jack is co-founder of Propellernet, a digital marketing agency that is a shining example of what happens when you make happiness your business model. We hate spam as much as you do. We don't pass on your data to anyone. Thanks for your interest in our e-book, now go check your email! Check out these happy startup communities popping up all over the world. We're proud to one of the first. We're looking for 20 budding entrepreneurs & changemakers to take part in the first tribe of our newly re-designed Home School online program. Could it be you? Learn how to use our simple framework and you'll be more confident in what you’re doing (and why) and much clearer on what to focus on right now. Our annual meeting of minds on a 300 acre farm in rural Sussex, UK. Due to unprecented demand for just 80 spaces, this year Summercamp will be invite-only. Just a few spaces left. Alptitude brings together 25 purpose-driven entrepreneurs and changemakers from around the world for a unique, meaningful experience in stunning natural surroundings.